curry | eat. live. paleo. 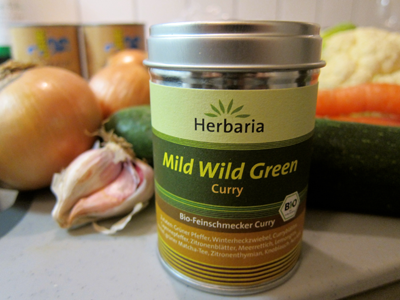 David and I discovered this great organic green curry powder while living in Germany. We loved it so much, we bought 2 cans of it and took them back to New York with us, just so that we could bring them with us to Stockholm. The cans weigh nothing and take up little room in the luggage — SO worth it. Green curry makes a great Sunday meal. I have made green curry the last couple of Sundays in Stockholm, in part because Sunday is our day off and I have more time to make dinner. Although green curry is easy (especially equipped with a fabulous-and-easy-to-use curry powder), there is a lot of chopping and prepping required. 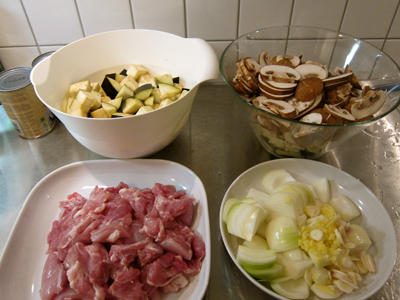 I like to lay out everything I’m going to use, so that I don’t forget anything I’d planned to put in the curry. The wonderful thing about curry is that you could put almost any kind of vegetable in it — it’s a great way to use up that half a cauliflower you need to eat, for instance. 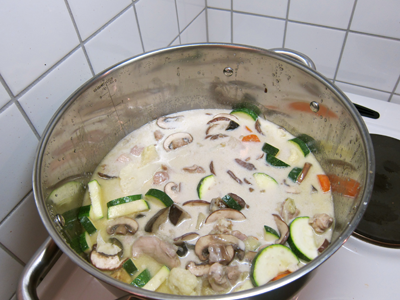 My basic go-to vegetables for green curry are onions (about 3), eggplant (1 large), cauliflower (half a head), carrots (about 3), zucchini (1 large), and mushrooms (a good amount — we love mushrooms! ); I always use a few cloves of garlic and a thumb-sized piece of ginger, too (both garlic and ginger finely minced). 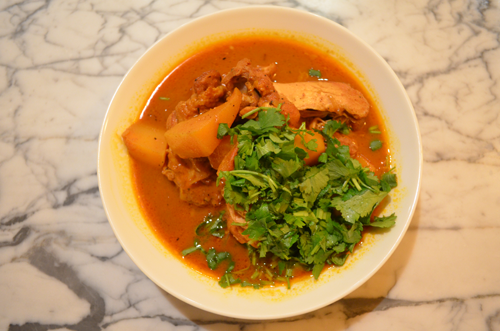 For chicken curry, I use skinless chicken thighs (about 2 lbs). I like to prep the ingredients in groups of items that should be cooked together. 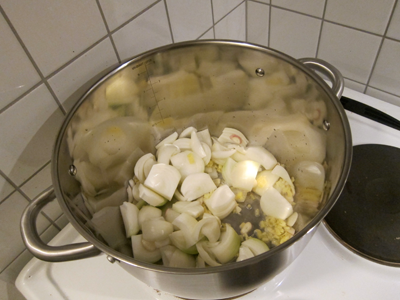 Here, onions, garlic and ginger are on one plate together, as they will cook first. Then, I have a plate of chicken thighs, cut into about 1.5 inch pieces. 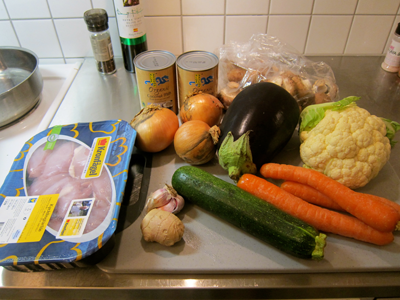 And then in the back (left), I have a bowl of vegetables that take a little longer to cook — chopped carrots and eggplant. In the final bowl (back-right), I have vegetables that cook a little quicker — sliced mushrooms, chopped cauliflower, and chopped zucchini. In a large pot, heat some coconut oil on medium-high heat. When heated, add onions, garlic and ginger. Add a pinch or two of salt, and stir with a wooden spoon. 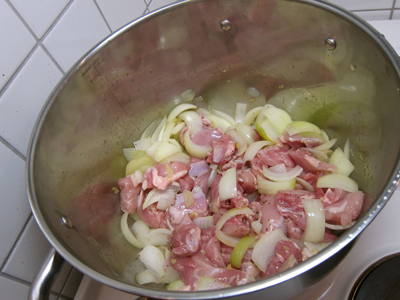 When the onions are tender, bring the heat down to medium and add the chicken pieces. 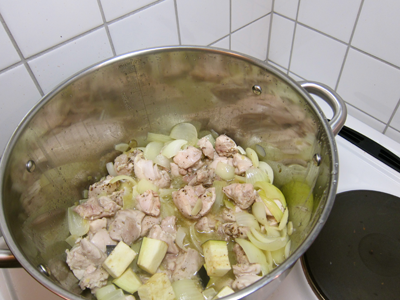 Season the chicken with salt and pepper, stir them around, and then put the lid on the pot. After about 10 minutes when the outer part of the chicken pieces appear cooked (although not fully cooked through), I add more the chopped eggplant and carrots. Cover; if your burner is really hot even on medium, bring the heat down some more. Our stove in Stockholm is not very complex, so I just try to keep it on a little higher than a “low” setting. After about 10 to 15 minutes, or when the eggplants seem to have softened, add the rest of the vegetables — mushrooms, zucchini, and cauliflower. Again, put the lid on. As the vegetables cook down, they will release a lot of water, which is just fine — I think of it as “vegetable broth” that will add flavor to the curry. After about another 10 minutes, add coconut milk. I use 2 cans for a large pot. If you can, I highly recommend buying good quality, organic coconut milk. I find coconut milk vary greatly in quality, and will very much alter the flavor of the curry. 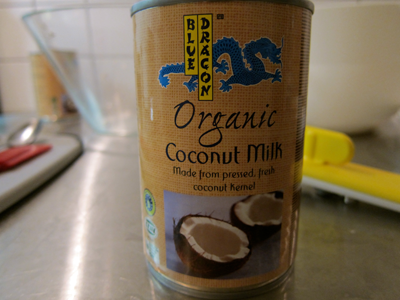 We found this Blue Dragon brand in Stockholm, which is delicious. 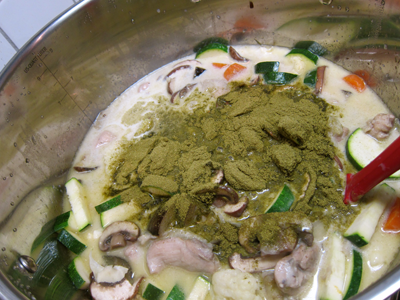 Add green powder to the curry. I use 3 generous tablespoons for a pot of this size. With a spatula, give the pot a nice, gentle stir. Bring the heat down to a simmer, and keep cooking until all the vegetables are cooked. I like to keep the zucchini on the side of al dente, so that they don’t totally disintegrate and disappear into the curry. 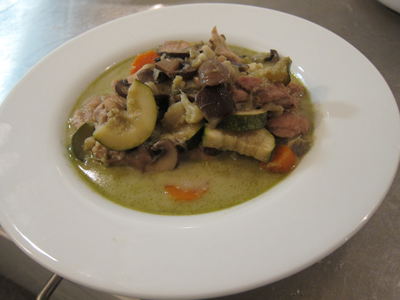 And here is a nice, hearty bowl of green curry with chicken! Green curry packed with fresh vegetables and protein makes a fabulously comforting dish for the winter. We are so happy that we have our favorite green curry powder with us as we experience our first Scandinavian winter. P.S. Green curry makes fabulous leftovers — maybe even tastier the next day!